The beautiful region of Tuscany in Italy is arguably both the most famous and the most desirable of all the Italian regions. From its capital city of Florence, synonymous with the art and high drama of the Renaissance, to the infamous leaning tower at Pisa, Tuscany real estate is situated in a land of iconic beauty and unique culture. Tuscany, known in Italian as Toscana, is truly a special place, and rightly famed the world over. 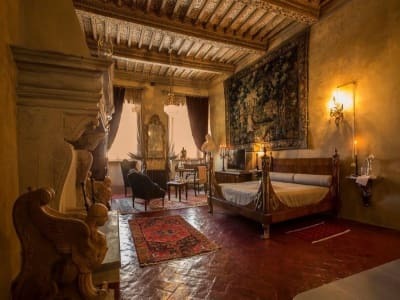 The combination of the historic and the aesthetic exists throughout the areas with available Tuscany real estate, with majestic and exquisitely crafted buildings set against the gently rolling Tuscan landscapes of vineyards and fields of sunflowers. With the endless Tuscan sun beating down on the breathtaking scenery, the area is the living embodiment of the rich Mediterranean colours of Italy, with red-ochre soils and lush green landscapes dotted with poppies and sunflowers. Tuscany real estate offers so much more than just bricks and mortar; it is the chance to step into a dynamic, living painting. With so many both fascinating and beautiful places to visit in Tuscany, even a lifetime simply isn’t enough to see everything that this stunning region has to offer. Tuscany real estate allows a permanent base from which to see the many wonders of Tuscany, yet, with such spectacular views from many properties, the temptation to simply watch the slow progress of the sun with a bottle of Chianti, some fresh, crusty bread and a crisp salad drizzled in the exquisite locally-produced olive oil is often too great. This is essentially what lies at the heart of Tuscan life; relaxation, manna for all the senses and unparalleled beauty, both natural and man-made. 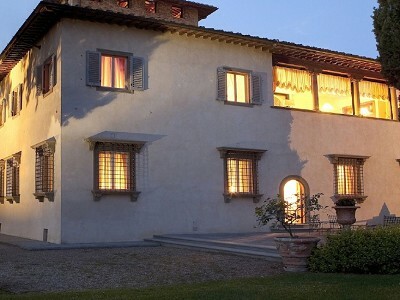 Tuscany real estate can be found within each of the ten provinces of the region; each with its own distinct character. From the coastal provinces of Massa-Carrara, Lucca, Pisa, Livorno and Grosseto with their sleepy fishing villages of whitewashed houses, to the mountainous Pistoia, Prato, Firenze and Arezzo stretched across the spine of the Apennine Mountains, and to the rural Siena, its slopes crowded with the famous Chianti vineyards. In each of these provinces, Tuscany real estate can be found to suit all tastes and budgets, from rural farmhouses set amid olive groves and vineyards, to luxurious apartments deep in the heart of the historic quarters of towns and surrounded by breathtaking architecture and cultural venues such as world-famous galleries, museums and theatres. The history of Tuscany can be traced much further back than the Italian Renaissance which has been imprinted on both the culture and the landscapes surrounding Tuscany real estate. It is less well known that in prehistory the Tuscan civilisation, known as the Apennine Culture, rivalled the ancient Greeks for technological and cultural milestones. In the second millennium BC, the people of the region had extensive trading links, including with the neighbouring Minoan and Mycenaean civilisations, leading to fascinating modern archaeological discoveries documented in the region’s many museums. By the 7th century BC the Etruscan civilisation was advanced enough to have laid an extensive transport infrastructure between its centres of habitation, agriculture and mining, and to have developed a unique culture with characteristic, vivid artistic styles, as described by the contemporary Greeks. It was not until the first century BC that the Etruscan civilisation was eventually absorbed into the Roman Empire. Today Tuscany real estate is situated in a truly ancient landscape and surrounded by the monuments and earthworks of prehistory and beyond. Not only this, but the strong and independent culture of the Tuscan people has existed into the present day, and Tuscany real estate is quite unique from the surrounding areas of Italy, adding to its already obvious charm. The rise of the wealth of Tuscany in the Middle Ages was greatly to do with its situation on the Via Francigena, the main route between France and Rome, and a popular pilgrim’s route. Many towns and villages grew up around the churches and monasteries offering food and shelter to the pilgrims, and Tuscany real estate can often be found today in places where superb churches with lavish architecture still remain at the heart of spectacular and historic towns. Of course, the most famous historical context for Tuscany real estate is the Renaissance. Tuscany is considered the birthplace of this movement, and therefore there can be found no better examples of the stunning architecture, exquisite paintings and sculptures of the Renaissance anywhere in the world. Florence, birthplace of masters such as Da Vinci, Michelangelo and Botticelli, is perhaps the centre of Renaissance art and architecture, and today, Tuscany real estate situated in this breathtakingly beautiful and historic town is set amid a plethora of museums and art galleries, many of which house some of the most expensive and famous works of art in the world, such as Michelangelo’s David. The wealth and influence of the famous Medici family is also literally written over the face of Florence, with their patronage influencing the art, architecture, and even construction of many of the most exquisite buildings in the town. As if the unique culture, historic importance, long, hot summers and beautiful countryside were not enough reasons to buy Tuscany real estate, there is still much more that Tuscany has to offer. The sunny climate and richly diverse rural landscapes give rise to some of the most exquisite produce found in Italy. As well as world-renowned wines such as Chianti, Tuscany is also well known for its production of olive oils and fresh fruits and vegetables. These delicious local ingredients, often found at the many markets, are used in the region’s mouth-watering traditional recipes, both in the home and in the region’s restaurants. 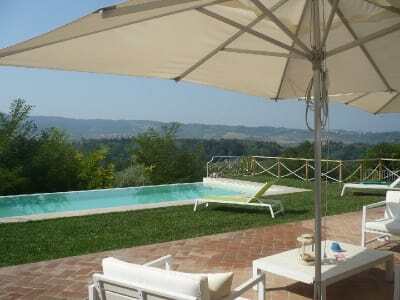 Tuscany real estate truly offers a delight to all the senses. The beauty and relaxing atmosphere that seems to pervade the air itself draws visitors from all around the world, and therefore the Tuscan transport system, including international airports, trains and roads are exceptionally well maintained, allowing good worldwide links. 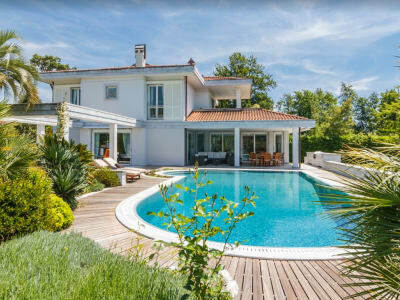 Many of these visitors are so attracted to the area that they stay, choosing from the vast selection of Tuscany real estate. Since the 1990s, the main influx of immigrants has come from the US and the UK, leading to a strong English speaking community within this friendly region, which manages to retain all the atmosphere and culture of traditional Italy, while providing all the familiarity of home and a community within a community. It is estimated that currently around 6% of the population of Tuscany are immigrants, yet with the strong regional identity and traditional festivals that occur frequently throughout the area, Tuscany still remains distinctly Italian. Of course, Italy is also famous for its designer labels and clothing and accessory shops. Tuscany is no exception, and the area specialises in high quality leather goods and lace. There are several factory outlet stores in the region selling top designer products at a fraction of the UK prices, and coupled with the craft stores, jewellers and antique shops located in all the main towns, Tuscany real estate provides a haven for even the most dedicated of bargain-hunter! Some of the most notable places with Tuscany real estate are the ‘art cities’ of Florence, Pisa and Siena with their galleries and museums, rich culture and many breathtaking churches, Lucca, a beautiful medieval city which possesses un-breached medieval walls and San Gimignano, known as the ‘city of towers’, perched on a hilltop near Siena. The coastal town of Viareggio is also a true gem in which to buy Tuscany real estate. Once a fashionable Victorian seaside resort, the town now boasts a wealth of facilities and a massive carnival held every February which is famous in the region. Of course, also with Tuscany real estate, is the famed isle of Elba, home of the exiled Napoleon. There are many ways to explore the breathtaking Tuscan countryside, and no Tuscany real estate is far from facilities to explore the rural landscapes on horseback, by foot or on a bicycle. As well as swimming in the calm seas of the coast lined with white sandy beaches, there are serene lakes inland, which also offer a variety of watersports. Tuscany is a place for an outdoors life, and there are many facilities to enjoy every kind of sport throughout the region but, more often than not, as the Tuscan way of life seeps into the bones, simply ‘being’ in the breathtaking beauty of the great outdoors is often more than enough.